As busy as Bob and Helen Lofthouse were in their careers, family and myriad community activities, they never lost sight of the needs of their community. 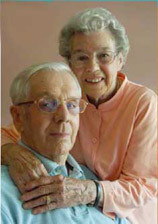 Bob and Helen met while serving in the medical branch of Canada’s naval service during World War II. They made Hamilton their home in the 1950s and raised four daughters here. Bob was an orthopedic surgeon at the Hamilton General Hospital for 37 years, and the head of Orthopedics for 22 years. He was the first surgeon in Hamilton to focus exclusively on orthopedic surgery as a specialty, and served as president of the Canadian Orthopedic Association. During the polio outbreak of the 1950s, he established a free clinic for children crippled by polio and gave hundreds of hours of his own time. In 1996, Bob and Helen purchased a life insurance policy for HCF in order to leave a legacy to their adopted “hometown.” More than just donors, they were connected to the Foundation through Bob’s involvement on the Board of Directors from 1993 to 1998. He also helped create the Community Health, Education and Research Fund committed to fostering innovative research and education in community health. The Lofthouses’ insurance policy gift will go to HCF’s Administration Endowment Fund, which helps support the operations of the Foundation.